This is the 14th cue card in the series of IELTS speaking cue card. 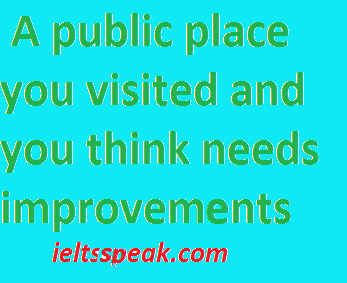 The name of today's cue card is "A public place you visited and you think needs improvements". What things do you dislike in that public place? What improvements do you want at that place? I live in Bhatinda it's located in south Punjab. there are many public places in my City where people often like to visit such as a shopping mall, Restaurants, parks or garden and many. Masses like to go in this type of civil places in their leisure time. Anyone can see the condition of the road the platform's, they are not well maintained and the roads are broken in many places. The platform's are crumbling and the cement is coming off. The canteens and the washrooms are also not very well maintained. so, in my opinion, This public area needs a huge investment from the government as a lot of people use this public place. If the government invest money in this civic area, Then this provides a lot of income to the government as the public is giving good income through this bus stand. The platform's need to be reconstructed and there should be digital systems for informing the daily passengers about the timings of the buses and all the other things. Furthermore, there is a lack of parking space there. thus, some people park their cars on roads which sometimes create a problem of traffic Jams. so there should be a proper parking space. In addition to it, the roads of this public place need to be well maintained and water systems need to be the improvement. we don't have very clean water there, people have to bring their own water or Bisleri or other branded bottles which are very expensive. Due to this reason, the RO system should be installed there. So this is the public place which in my opinion needs a lot of improvement because this area has not been maintained for a long time. Do you like to exercise in public places such as parks? Do older people or children like exercising in the public place? What measures should governments and dwellers take to keep these places clean? tags- A public place you visited and you think needs improvements A public place you visited and you think needs improvements A public place you visited and you think needs improvements A public place you visited and you think needs improvements A public place you visited and you think needs improvements A public place you visited and you think needs improvements , A public place you visited, A public place you visited and you think needs improvements, best home improvements to increase value, best loan for home improvements, best loans for home improvements, best way to finance home improvements, cornerstone home improvements,.